Swimming pool service and maintenance in Western New York. Everybody Smiles with Smiley. Best Swimming Pool Service. Best Value. Smiley Pool Service is Western New York’s most reliable swimming pool service company specializing in pool maintenance and care, equipment installation and repair, pool openings and closings. When it comes to expertise, reliability and satisfied customers, nobody comes close to Smiley Pool Service. From open to closing and everything in between: scheduled cleaning, chemistry balancing, equipment maintenance. Call us to solve your pool problem. We keep your pool running smoothly. Our expert technicians can maintain and repair your pool equipment. Hundreds of happy customers rely on Smiley Pool Service to keep their swimming pools worry free and fun. Our expert chemistry knowledge ensures your pool is balanced throughout the season. Steps, walls and bottom treatment is addressed in every scheduled cleaning. Expert care and attention to detail ensures that your pool is ready for the next season. SAVE $100 and bring the sparkle back into your pool with our acid wash services. Our openings and closings ensure your swimming pool is properly closed, expertly opened and ready for you to enjoy. SAVE 20% and keep your pool cover maintenance simple. LOOP-LOC pool safety covers are famously strong enough to hold an elephant. A clean pool is more enjoyable and safe. 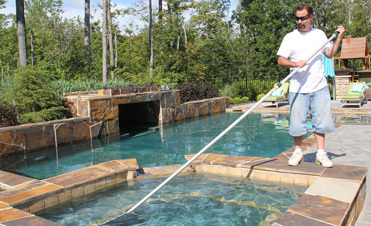 Regular cleanings can prolong the life of the pool and equipment. Here in WNY, we generally can open swimming pools as early as late March or early April. As soon as the daily temperatures hover around 70 degrees, your pool becomes a breeding ground for algae, especially for swimming pools with mesh winter covers that allow sunlight through. This can result in days of work to get the pool ready for swimming. Generally, by opening up earlier, you’ll have a clearer pool and won’t be greeted with the green glow of algae. Pollen is another factor to consider and can wreak havoc on static water. When the pool is open and the water is circulating, the pollen will be sucked into the skimmer and caught by the filter. Plus, a sparkling clean pool looks much better than a pool cover any day! As long as the water is circulating, and heating if it’s cold, you can keep the pool open well into November, in most cases. We even have a customer who keeps the pool open all year and doesn’t mind the heating bills. Just like it’s not advised to open the pool too late as the air temps are staying warm, the same goes for closing the pool. Leaving it open until the daytime temperatures cool is a good idea to avoid algae growth. Water needs to be consistently below 65 degrees to avoid algae growth. So feel free to enjoy the sparkling clean pool a little longer! We suggest testing with a testing strip a couple of times a week. Keep in mind test strips get old, so buy a fresh pack at the beginning of every season. To ensure your water is balanced, we suggest professional testing every 2 – 4 weeks. There are various other levels that need to be tested on a regular basis that are not tested with test strips. Professional testing is much more accurate than home tests, ensuring your pool water is safe and balanced. You can take a water sample to your local pool store or contact us. We’d be happy to professionally test your water and offer recommendations to keep it balanced. There are many factors that attribute to pool water chemistry and sometimes it’s a challenge to solve. Give us a call and we’ll send our expert chemist over to solve the problem. The cleaner the filter, the cleaner the pool. We recommend weekly backwashing to keep your filter clean and able to affectively filter the pool water. If you’re unsure of how to properly backwash or care for your pool consistently, we can help with our regular maintenance packages. If chemicals are added to balance the water - pH, alkalinity, calcium hardness – it would be safe to swim within an hour of adding them because they incorporate into the water quickly. If shocking the pool, wait overnight before taking a dip. Pools are healthiest when circulating and chlorinating. Ideally, you want to have the pump and chlorinator on a timer. If that’s not possible, promise a friend or neighbor a great souvenir for caring for your pool while you’re away! And if neither of these options will work for you, give us a call and we can schedule in your maintenance. There are several factors that could cause a breakdown of your salt system. We recommend professional advice on this one to avoid any additional possible damage. Contact us to evaluate and repair your system. Smiley Pool Service has been providing pool care consultation and performing opening/closings since we've owned our pool. Paul's vast knowledge of pool chemistry has been a great help. We look forward to Smiley taking care of our pool for years to come. Smiley Pool Service has been taking care of my pool for almost a decade and I wouldn't even consider having anyone else touch my pool. Paul and his team always go the extra mile to make sure things are right and that we, the custsomers, are happy. Paul has been taking care of my pool for years. In addition to his comprehensive knowledge of pool chemistry, equipment maintenance and repair, I really appreciate the fact that he always makes himself available. There is great peace of mind to know that I can call him any time, even after hours if I have a problem. He's dependable and get's the job done. Read about what more customers had to say.